Barry Lewin and Silvia Salvadori Spoke at the University of Chile’s Seminar - Gottlieb, Rackman & Reisman, P.C. On March 23, Barry R. Lewin and Silvia Salvadori presented at the seminar on International Patenting at the University of Chile, the largest university in Chile. They delivered presentations on software patenting; considerations for inventors in preparing global patent applications; considerations for biotechnology, including chemistry and medical devices; and global patent portfolio management. 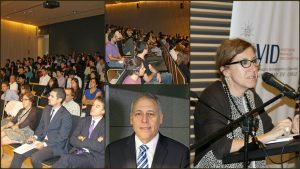 More than 100 people attended the presentations, including faculty, Government officials, Chilean patent attorneys, and administrative people from the University including the technology transfer office and the IP office. The University of Chile was founded on November 19, 1842. It is the oldest and largest university in Chile. The University is located in the capital city of Santiago and its research is recognized worldwide. The University Of Chile is recognized for its leadership and innovation in science, technology, medicine, dentistry, social sciences, mining, energy, astronomy, and arts through the creation functions, extension, teaching, and research. Read the press release in Spanish here.